A customisable minimalist running vest for all conditions. The TrailFire vest is stripped down to the essentials, a low-profile, highly-versatile vest for any length of race or training. Multiple attachment points on the back allow you to expand the load carry by attaching the compressor pod for longer races. The Trailfire is also compatible with bladders and flexi flasks to provide hands-fee hydration. Customise for Your Race: Designed to work with our accessories to allow you to adjust the setup to your requirements. Featuring 4 front pockets including 2 with secure closures and a large dump pocket on the back. The Trailfire has many attachment points to add extra storage space. You can attach the compressor pod adding 4 litres of extra storage customising the Trailfire vest to meet your needs. 125g Minimalist Construction: Made from a breathable stretch mesh allowing for high ventilation and a minimal weight of 125g. 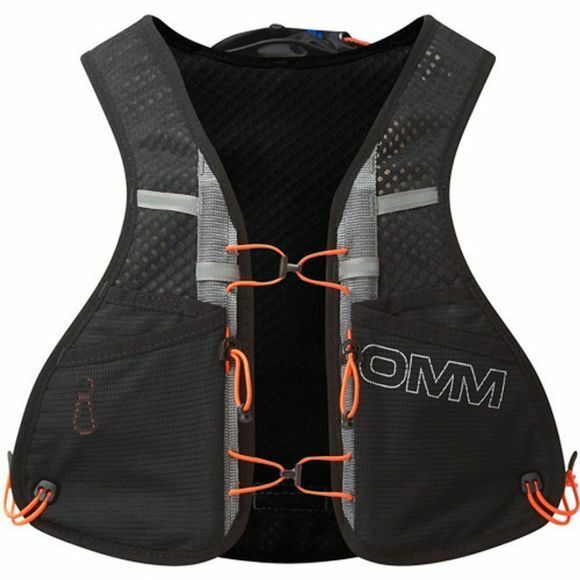 The Trailfire fitting system uses a replaceable bungee tensioning system to keep the vest stable and move with you during high levels of activities. Hands-Free Hydration: There are several water carrying options compatible with the Trailfire vest. You can use the FlexiFlask bottles to sit in the front chest pockets providing up to one litre of capacity. Alternatively for longer runs you can add up to a 3litre bladder into the back pocket and thread the hose over the shoulder providing hands free hydration. The compressor pod can still be attached to the outside with the bladder in the back pocket.